Try these free Hazard Perception Tests. Click the "Hazard!" button when you see a developing hazard. Hazard perception test is the second part of the UK theory test. Theory test is a mandatory test which all UK learner drivers must pass to obtain a full driving licence. The test includes multiple-choice questions and hazard perception test. Here you can find information about hazard perception test. Also we provide FREE hazard perception test practices. What is a Hazard Perception Test? Learners will watch fourteen one minute long hazard perception test video clips (nineteen clips for lorry and bus candidates). Hazard perception clips are computer generated imagery (CGI) and filmed from the perspective of a passenger car driver. Learners have to indicate, usually by clicking a mouse button or touching the screen, when they observe a developing hazard. All of the hazard perception clips will include one developing hazard, and one will include 2 hazards. The sooner the student reacts to a developing hazard, the more points are scored. Points are from five down to one, with no score if the examinee reacts too late. Here you can find more hazard perception tests for online practising. What does "hazard perception CGI" mean? CGI comes from Computer-Generated Imagery. 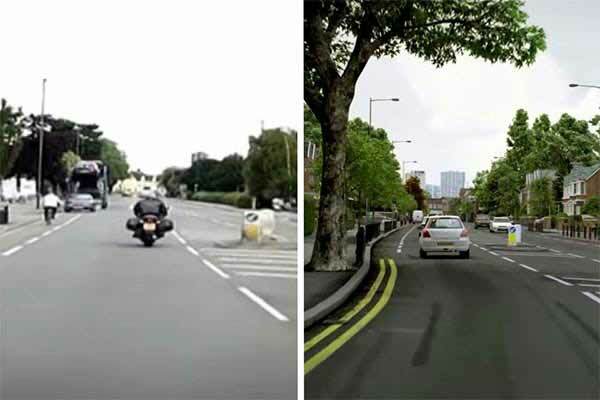 CGI clips replaced the old filmed hazard clips in the hazard perception part of the theory test on 13 Jan 2015. The reason why they changed filmed clips to CGI clips was that the image quality wasn’t clear enough. Here you can see a picture where on the right is an updated hazard perception CGI clip. These new CGI clips looks clearer than the old ones. Even the clips are now CGI, there are no other changes in the test. Hazard perception test 2018 contains 14 CGI video clips. The clips features everyday road scenes. Each of the clip contain at leas one developing hazard and one of the clips will contain 2 developing hazards. What is a developing hazard? Developing hazard is something that may result in you having to take some action while driving your vehicle. The action can be for example changing your speed or direction. There are many ways to practise for the UK theory test. If you want to pass your theory test, it is highly recommended to practise for the theory test using sites which offer theory test practices. Websites usually have the latest DVSA revision questions. Which website to choose for theory test practising? A website which offers the official DVSA revision material (hazard perception test and multiple-choice questions) is of course your best choise because the questions are almost same as in the official test. Keep in mind, the site should also have the DVSA hazard perception clips because practising only the multiple-choice question is not enough to pass the whole theory test. There are no websites or apps which offer exactly same questions as in the official test - official questions are not public. There are many completely free websites but it is worth to know that none of them offers DVSA made revision questions. Search the best site for you which has the DVSA revision questions and Hazard perception test and you can make sure you are practising with the most up to date material. Theorytest.org contains all the official DVSA revision questions and CGI videos. I would like to say that this site is really helpful and really good for passing my theory test thank you so much for this lovely site. I ended up using this theorytest.org, there are those new CGI hazard tests and they helped me a lot. Well I've had a full car linence since 1988 and a full motorcycle licence since 1996 however, I need to do the Hazard perception & Theory tests as I am imminently training to drive LGV. The problem I have with the hazard perception test is that as a motorcyclist, I'm seeing and reacting to hazards long before the DVLA's scoring "window" opens, I'm seeing hazards that are very real to me but not the ones they want me to see so I have to be careful not to click too many times... it's just a nightmare, I really have doubts about whether I'm going to pass this first time. I have made some videos about how I think these tests are not a fair representation of either someone's ability to avoid hazards or of their roadcraft in general and will maybe put those on youtube and post a link in the DVLA twitter feed. I honestly think they are just a good way of getting the extra test fees for the re-takes. I know how you feel. I am not a biker but have been driving since I am 16 and was also shocked to see that I had failed the hazard perception. I was more worried about the multiple choice, which turned out I got 48/50 correct. The hazard perception test is very disciving, as at the begining they say that if you click too many times, the computer will think that you are just "clicking away" and you will be scored 0. There were a few occacions when I clicked on a potential hazard before the computer window opened, and therefore the computer did not recognize that I had already seen the hazard. Not a very good test and I am another £25 down. Im 100% with you on this, I've passed my Hazard Perception for Car, and for Motorcycle. But after driving and Riding for 10 years Im now doing LGV, Im struggling with this because I'm seeing the Hazard develop alot sooner than the test allows! It doesnt allow for experienced drivers. This is exactly my problem !! Totally agree. I have been driving for 36 years and also hold an LGV license and I too look a good distance ahead as breaking distance is obv greater, so I find myself clicking too early. Surely it's about how you are reading the road and not how you click on a computer. I totaly agree I have failed my HP twice now, as an experienced driver I spot the hazards in advance and having no sound or engine noise is very off putting, I think a fair system for people training to be ADI'S or HGV drivers or any other professional driver would be to have an half hour commentry drive. I also reckon that £83.00 for the test is very expensive compared to what novice drivers have to pay. I to failed my HP Test ive been driving for 30 years and as you say I also spot hazards a lot earlier than an inexperienced driver. I found the position of the camera view wrong as when you are actually on the road you do have some side vision. One of the clips showed the vehicle coming off a roundabout with a brick wall on the nearside the position of the camera made it feel as though I was actually going to drive into the wall which did put me off track a bit. I think that u don't lose pounts when react more than once to the situation as long as u don't over do it! I totally agree with this.They are made to take extra money from people and they don't represent driver real knowledge.It is a joke.I considering if I can go in other EEA country and take a test in English.I own full licence for the last 17 years from other non- EEA European country and government in UK lets me drive only for a year before I need to take a UK test again.Why they let me drive on the first place?!!! Holy crap. I'm exactly the same as you, I'm seeing potential developing Hazards WAAY before the "scoring window" opens up and as a result of being a forward thinker I'm penalised? It's absolutely ludicrous. I totally agree with you here Eddie. I just sat my hazard perception test and failed! I was very conscious of not over clicking but think that my perception of the hazards started before the clips scoring kicked in so my click wasn't counted! I sent an email to ask for my results to be analysed as I am very well aware of the hazards. I agree that I failed because they want me to take the test again for the fees not because I wasn't fully aware of the hazards! I am also a motorcycle rider and have found the same problem. See the hazard and count to 2 then click - seems to be working in the practices!! I agree! As an advanced driver my hazard perception skills are far better than a "normal" driver and I can notice hazards well ahead so I have scored zero on some clips as I've clicked far too in advance but don't want to click too much to be accused of "cheating"
Agreed. It's basically testing your ability to click in the fashion that they want. I have the same problem as you, When I took my theory test about 3 years ago the test will have similar marking system but will be more accurate on the times, so when you see a car coming through a tunnel wide enough for only one car, for example, It will mark you from the time the sign becomes visible ect. Actual theory test questions are not public, however, you can practise the DVSA theory test revision questions here: www.theorytest.org.